This post comes to you from the couch in my new living room, curled up next to an electric fireplace that they used to stage the home, with a large mug of bourbon spiked apple cider. I love this house. And normally I would love the rain that’s pitter pattering against the windows. But not this time. You see, a house built in 1926 is bound to leak and leak it did, through the window sills and the garage walls. Such is homeownership, I suppose, and that means we’ll finally get to put to use all of those hours spent watching the DIY channel. In the meantime, rain means catching up on the blog. There’s quite the archive of pictures and scribbled recipes patiently waiting to be transformed into a published post. 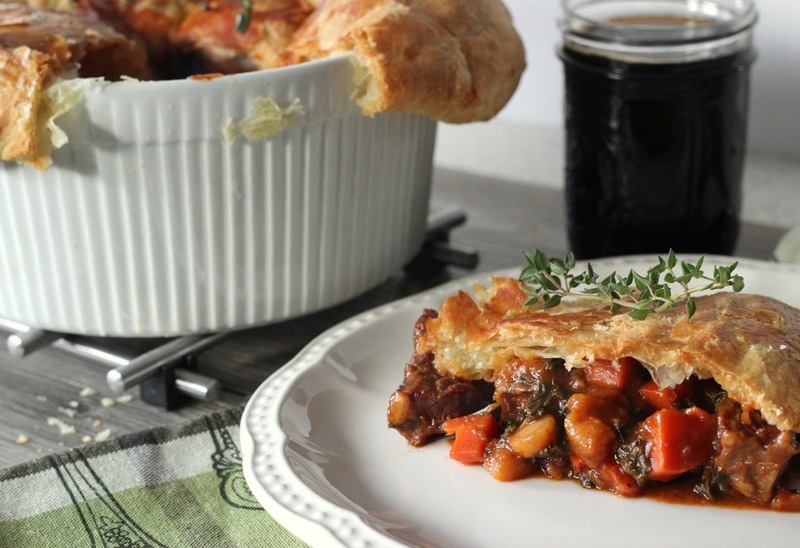 So let’s begin with a recipe perfect for the winter.. short ribs braised in barrel aged beer. 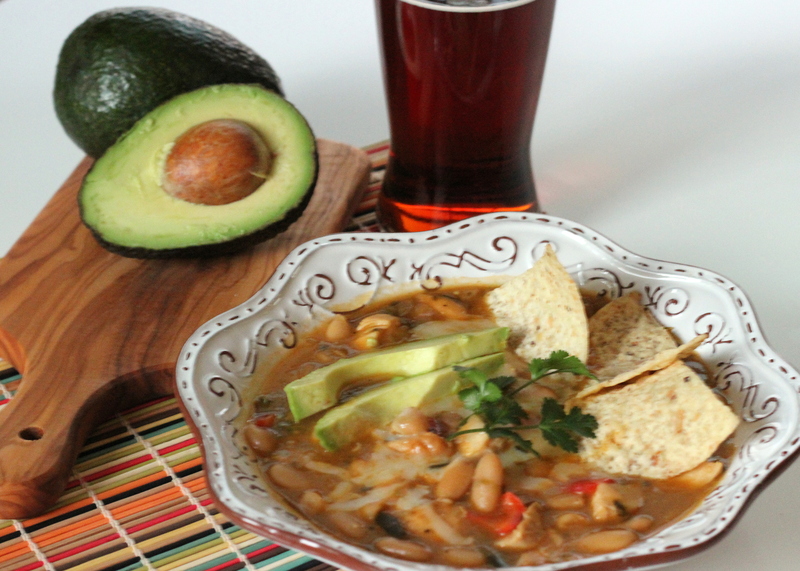 It’s a dish that’ll comfort even through blustering rains. I dipped into my cellar for this one and used a very limited release sour red ale aged in bourbon barrels that was released for Green Flash’s 10th Anniversary. 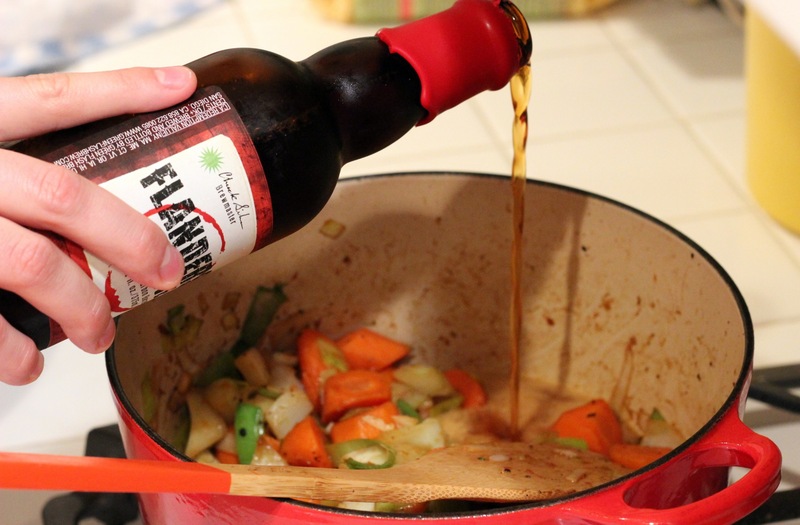 This is a braise we’re talking about, though, so any Flanders Red will do, but a barrel aged one adds a nice depth to the finished dish. 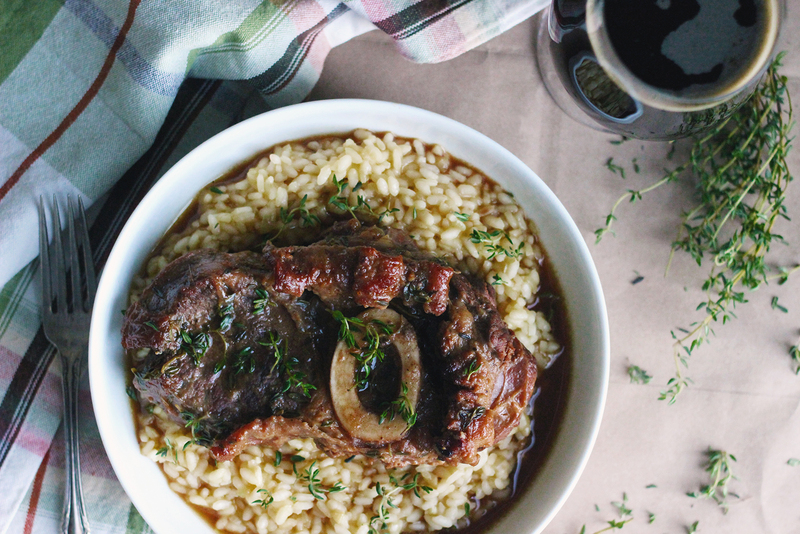 Take the short ribs out of the fridge and leave on the countertop. While the ribs lose their chill, coarsely chop the carrot, onion, and fennel bulb. Season the short ribs with salt and pepper on both sides. In a large dutch oven, heat 2 tbs. canola oil over medium heat. Add the short ribs, working in batches if needed to avoid overcrowding. Cook until both sides are sufficiently browned, turning once. Transfer to plate and set aside. Reduce heat to medium low and add the carrot, onion, fennel and garlic. Cook until soft and beginning to brown. Add the beer. Raise heat to medium high and bring to a boil; reduce heat to maintain a simmer. 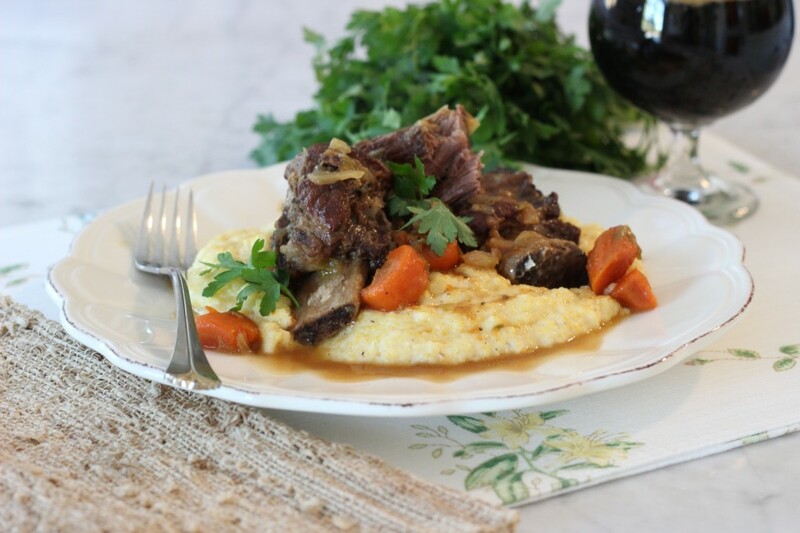 Return the short ribs to the pan and add enough stock to cover; add the bay leaf and thyme sprigs. Cover and cook in the lower third of the oven for 2 to 2 1/2 hours. Remove from the oven and offset lid to allow the heat to escape; allow to cool slightly then cover and place in the refrigerator overnight. To prepare, remove the solidified fat. Place on the stovetop over medium heat. Cook until the sauce reduces to about 1/3 of its initial volume. Spoon the sauce over the ribs during the process, about 1 hour. Season with salt and pepper. 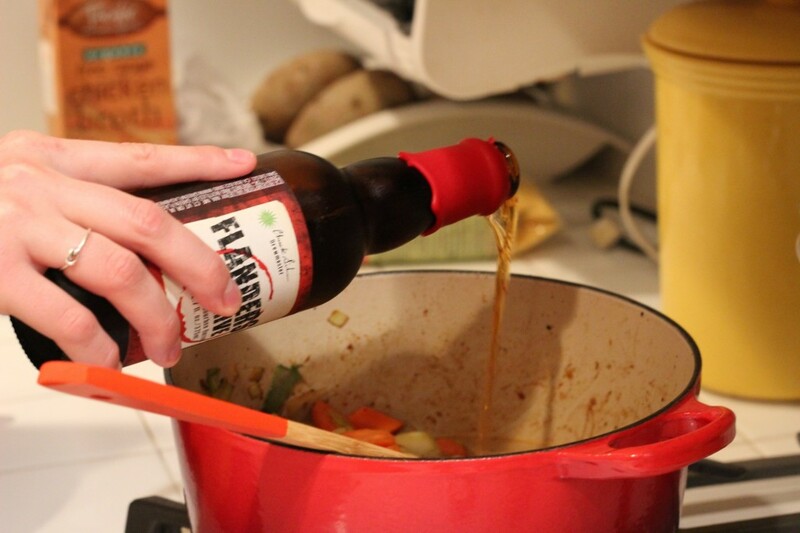 Add the balsamic vinegar, to taste, a tablespoon at a time. To serve, spoon over heaping portion of polenta. In a fancy mood? Remove the remove the short ribs and strain the sauce. Return the sauce to the pan and cook, stirring often to prevent burning, until reduced to a thick glaze. 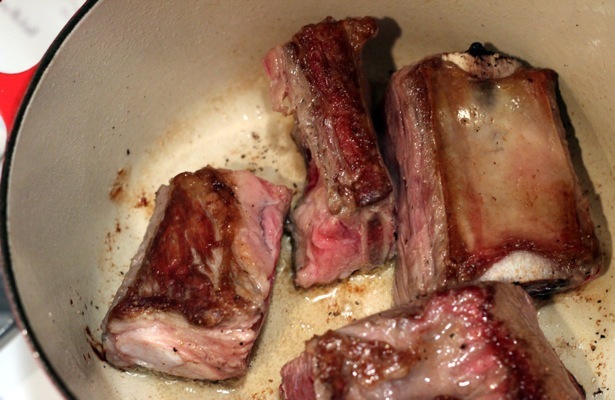 Add a pat of butter, season with salt and pepper, and spoon over the short ribs. 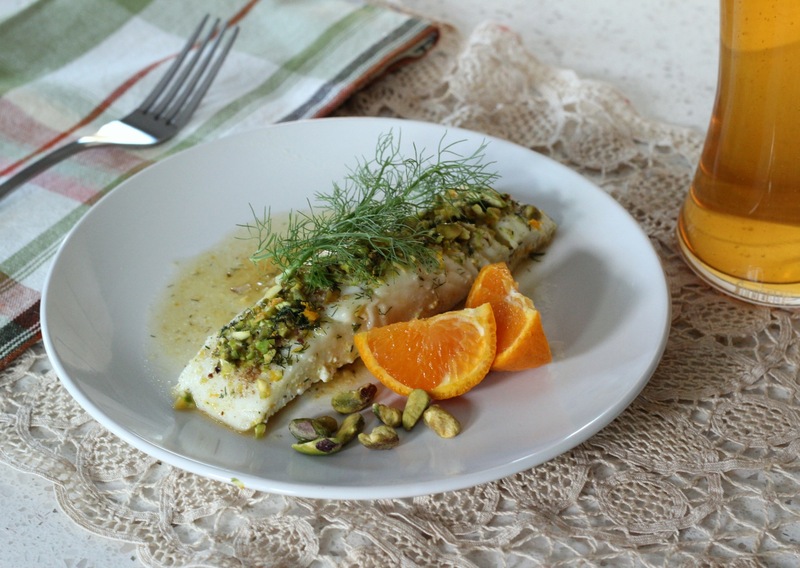 Garnish with chopped parsley or fennel fronds.